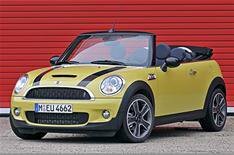 Mini Convertible driven | What Car? Timing is everything they say, so with summer just around the corner, Mini has seized the opportunity to launch its new convertible. Time spent with the roof down is something you'll be able to measure if you spec the 100 Openmeter we kid you not that records the amount of time you spend with the roof down. Gimmicks aside, the Mini rag-top should prove pretty effective at dealing with the inclement nature of a typical British summer. All you need to do is press a button and, 15 seconds later, you'll be enjoying the alfresco life. Should you get caught in a sudden shower, there's no need to pull over, as the roof rises at speeds up to 20mph. Alternatively, if you want to only ruffle your barnet, the front portion of the roof can be opened by 40cm to create a sunroof. Once in place, the roof is pretty effective at blotting out wind noise, although it's nowhere near as quiet as a folding tin-top. It's even better news when it comes to rear visibility something that was universally criticised in the previous convertible. The rear roll-over bars that were so prominent have been sunk behind the headrests, so you get a much better view out of the rear window. That said, because there's no rear wiper, the rear screen gets dirty pretty quickly. As for the drive, well, the bodyshell is rigid enough to resist shakes over all but the worst surfaces so the ride remains comfortable. That stiffness also means there's very little compromise in the handling department, with sharp steering and loads of grip all adding to the fun. Add a range of fizzy, sweet-revving engines and already it's looking like a scorching summer.